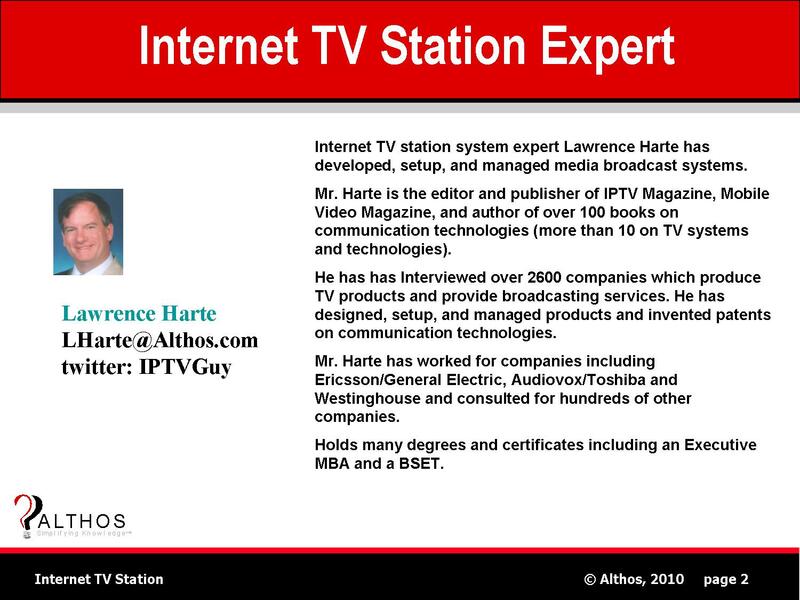 Internet TV Station system expert Lawrence Harte has develop d, setup, and managed video and media broadcasting systems. Mr. Harte is the editor and publisher of IPTV Magazine, Mobile Video Magazine, and author of over 100 books on communication technologies (more than 20 on TV systems and technologies). He has Interviewed over 3100 companies which produce TV products and provide services. He has designed, setup, and managed products and invented patents on communication technologies. This book explains how Internet TV stations operate and the different types of equipment and encoding options. Discover hosting and programming options, technology basics and industry jargon, and how to produce original content. Internet TV economics, including advertising and T-Commerce are explained, as well as content licensing and user targeted promotion.